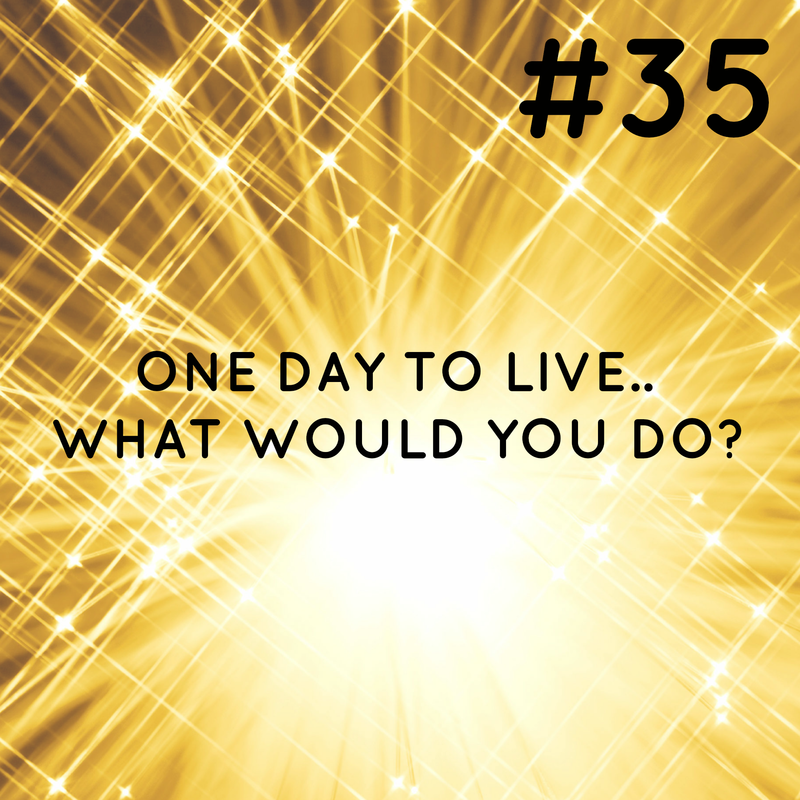 #35 If you only had one day to live, how would you spend it? Today’s post is #35 – if you only had one day to live, how would you spend it? Okay so I started out writing this as a list of the things I would do, but it is way too hard! I also noted that the list of things I would do on my ‘last day on earth’ is actually quite unimaginative. It involves family time, bike riding, copious amounts of coffee and good food with friends. When I looked back at it, it read like a standard Sunday! I can just hear the man screeching at me now “its your LAST DAY ALIVE can’t you think of something exciting you would want to do”. Nope I honestly cannot! Which got me thinking, I’m in a pretty good place if the best I can come up with for my last day on earth is basically a normal Sunday for me. Obviously knowing its my last day alive I guess I would live it a little bit differently, if little man screamed all day like he did yesterday I wouldn’t mind, I would just let him stay up and cuddle him knowing it was my last day alive. But why didn’t I do that yesterday when for all I knew it might have been my last day? So..I turned to google for help. After googling ‘last day alive how to spend it’ (yes I really did that, what of it!) I came across this TED conversation and it turns out my unimaginative ‘last day’ is quite normal that is, most people focus on what matters most to us but knowing it is your last day you are ‘in the moment’, not thinking about the past or future just ‘now’. I have an upcoming blog project that will touch more on this but this living ‘in the moment’ is something I am trying to do more often. Its a bit sad but I find it really difficult. I’m easily distracted and I have to work REALLY hard at it! But, being more aware of that is a step in the right direction I think. So perhaps the answer to the original question about how I would spend the last day of my life would be that I would spend the day with my family, friends, doing what I love -riding bikes, drinking coffee, cuddling my screaming baby and being in the moment while I do it all! Wow there you go, quite a serious post that one! What would you do if you had one day to live? 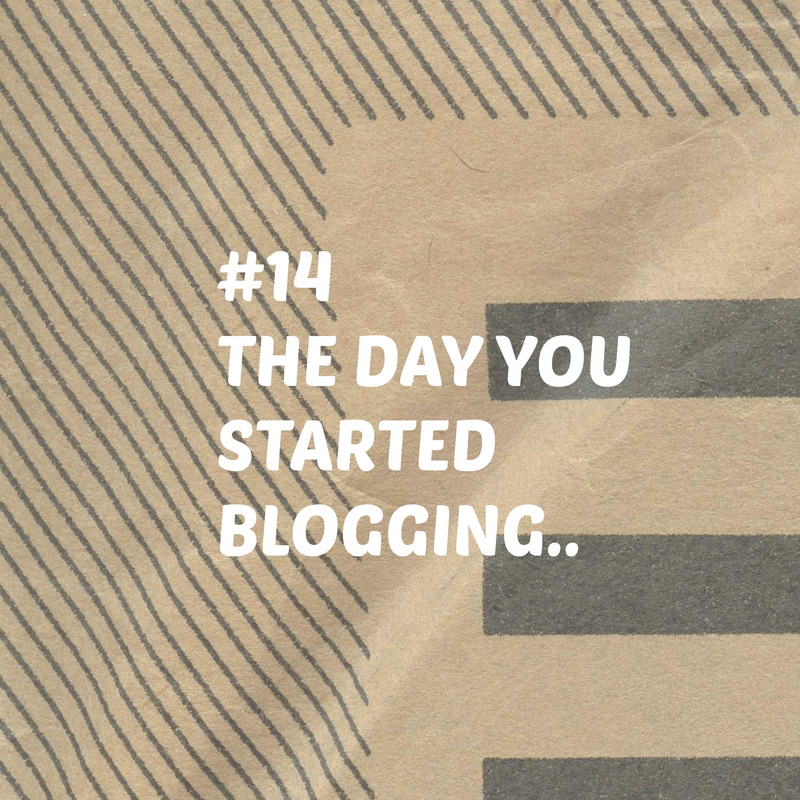 Today’s post is #14 – the day you started blogging – what were you thinking. I was initially put off when a friend said ‘who would want to read about what you do every day’. She was probably right, my readership is not exactly your Woogsworld or Dooce but I’m glad I stuck with it. I don’t think I would have had any aspirations of greatness then as back in the olden days you just blogged for yourself not to make money or anything! Those with a keen eye might have noticed I’ve been blogging a bit more lately. I’m trying to give the blog a real go for six months and see what happens. The more I write, the more I feel like writing so hopefully I can keep it up. Here’s a link to my first ever post. Compelling isn’t it. I’m sure there were many more but those are the main ones! I follow maybe 30 or so blogs on Bloglovin’ but I know there are so many more out there I would love to read, I really like it when I find a new one I like and add it to the list. I was pretty slow to the whole RSS/feeds thing, I wasn’t even upset when Google Reader was canned. My Mum was, but I wasn’t. I read a few different types too, yes your Mummy blogs feature heavily in there but also lots of athletes, foodie bloggers and some gardening/cooking blogs. What else? Oh I love comments on my posts, they make my day! On here or any of the socials, Facebook, twitter and instagram. 2. Coffee’s hot and the toast is brown…its not? Well it should be. 6. Sydney – through the eyes of a Melbourne snob. Today’s post is #37 – a guide to the town you live in. I live in Albury, NSW. I’ve taken a bit of a tongue in cheek approach to this one! 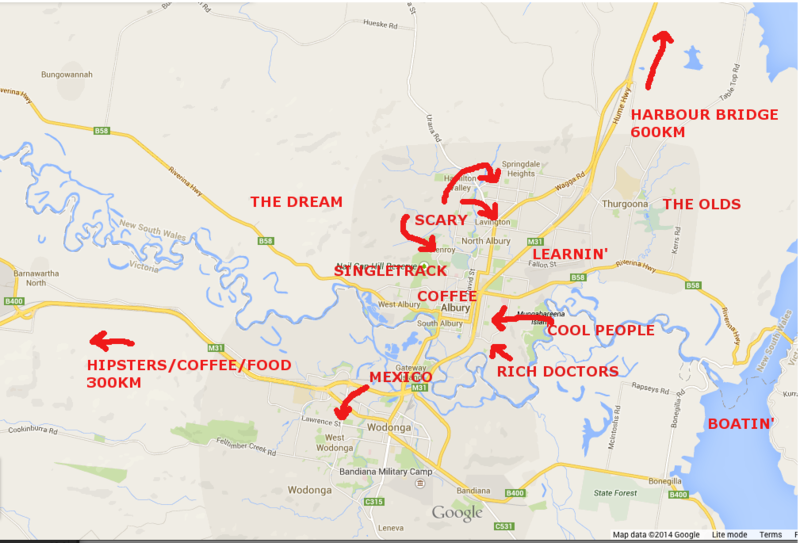 I saw a map of Melbourne like this the other day which was quite funny so I’ve applied some of that to my own town of Albury. of the Border). Until I moved back here I wouldn’t be caught dead living in Wodonga but I have since changed my mind. I would dare to say most parts of Wodonga are really nice. I’ve been doing a lot of driving around with a little man asleep in the car and have checked most of it out …there are some really nice spots! Rich Doctors – Refers to ‘Doctors Point’ – I think its called this because all the ‘rich doctors’ live out here. Its very nice, but expensive and I’m betting all the houses would have kitchens that would need renovating to come even close to ours! Cool People – Where we live! There is ‘old’ East Albury where we live and then anything east of East St and south of Borella Rd makes up ‘new’ East Albury. Like I said in yesterdays post, I initially didn’t want to live here. But its super nice with a lot of old houses being renovated and tree lined streets that are amazing in autumn! Plus we have a great view over the rest of Albury. Learnin’ – Where I went to school, both primary and high school are in this area. Singletrack – Local MTB trails on Nail Can Hill. Guide to the trails here. They are awesome and I’m so lucky to live in a town where you can be on the trails in 7 minutes from home! And I live over the other side of town from them! The Olds – Where my parents live. They moved here from an area labelled as ‘scary’ when I was about 16. Harbour Bridge – nod to Sydney. We rarely go to Sydney, Melbourne being much easier to get to. Coffee – also obvious…where I get my coffee fix from! Many different establishments! I won’t name them…but I love you all! Scary – Suburbs that are a bit scary to live in! Or have parts of the suburb that are! I guess sadly you would say they have a lower socioeconomic status than other areas such as central Albury. Lavington is known colloquially as ‘Lavghanistan’ or ‘Stabbington’. Oh and, The Dream – In my driving travels around with a catnapping baby I stumbled across Splitters Creek. We used to go and visit some friends of my parents out here when we were kids so I knew the road already but there are some really nice houses out here. Its close to town, but not too close, and really pretty! Ideally we would build and not live anywhere near it until it was 100% complete. Just a pipe dream…but its nice to have a dream I think. Anyway there you go – call it a midweek special and we’ll be back to regular programming tomorrow! Today’s post is #15 The most difficult decision you’ve ever made. Write from the heart. Getting down to the business end of the 50 things to blog about now! I tried not to do the easy ones first but that’s obviously what I’ve done as I’m struggling with the tail end! Most difficult decision I’ve ever made. Well I guess it would probably have to be in 2011 when we were living in Melbourne and the man got made redundant. Things looked bleak until a tip off from a friend about a job in Wodonga and of course they loved him and they offered him a temporary position. At the same time he got offered a post-doc position in Melbourne. We decided the man would turn down the post doc position and give the job in Wodonga a go. Obviously with a view to maybe moving back if the job worked out. For a few months we lived apart, him in Albury with my parents and me looking after our place in Melbourne. I can say this without checking with him but it was a hell of a lot harder for me to consider leaving Melbourne than it was for him. While he had one close friend there, I had all my close friends there and most of his close friends were up in Albury. They’re my friends too, especially now – but at the time it felt like I was leaving all my friends behind. Buuuuut on the plus side my family is in Albury. Albury is a nice place to start a family of our own. Its so much ‘easier’ to live here than in Melbourne. It made sense to move back. But I still didn’t want to. I was in a really good place with my riding buddies, my work….me me me, I, I, I ….you get the picture. What about the man? What did he want? Renovate it he said, it will be easy he said. 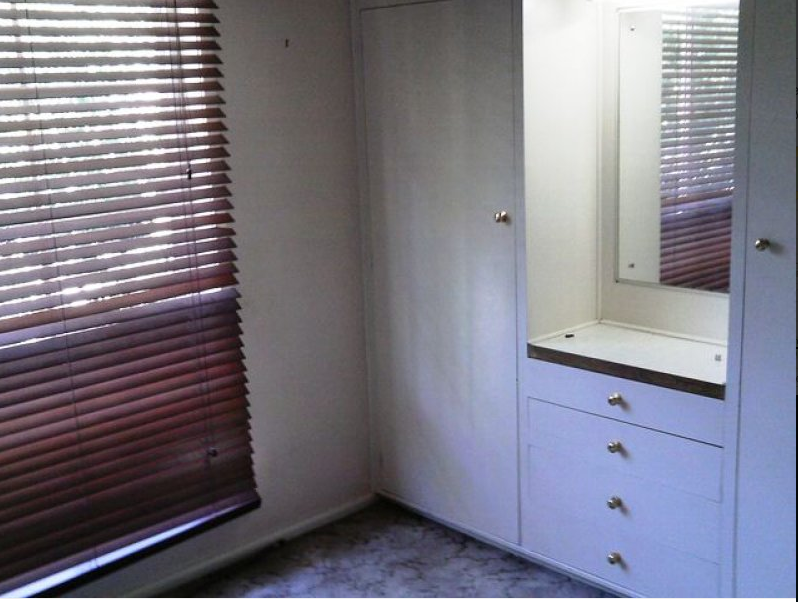 Eventually after me digging in my heels (or my cleats rather) I had to make the call and acknowledged that everything pointed to moving to Albury and we said yes to buying the hideous house and moving back. Many, many tears followed but two years later I have to admit that I/we made the right decision. Where we would be if we’d stayed in Melbourne I don’t know. I’m pretty sure we wouldn’t be enjoying little man. Its kind of one of those sliding door decisions I guess. I still miss Melbourne and I still have a moment every time I get to that point driving in on the Hume where you can see the city skyline, *ah there it is*! But its not quite the same anymore and now I also feel the same way driving into Albury – oh its good to be back in my little town. We’ve made a heap of friends here, the hideous house has worked out pretty well – its not hideous anymore! Another point to the man. The man has ‘the boys’ his group of mates, they’re a great bunch of guys and we are so close to all of them and their partners and there’s starting to be kids everywhere – I absolutely love it. And being close to my family is unreal too, I’ve gone from seeing them a few times a year to sometimes a few times a week, especially my Nan. So the man as much as I hate to admit it, and although it counts as the most difficult decision I’ve ever made – it was a pretty good decision in the end. I could do a whole post on how I currently feeling like I am losing the plot as little man will just not settle today but thankfully I have something better to write about. Let’s take a trip back in time, back to 2009! The man and I visited Movieworld also known as Hollywood on the Gold Coast during our honeymoon and after I finished shaking with terror after being made to go on some AWFUL rides – Scooby Doo Spooky Coaster I’m looking at you, I picked up some souvenirs. My favourite souvenir was a Batman stubby holder – it came with a CAPE! A stubby holder with a cape, it was awesome!! That stubby holder got a work out in Queensland, filled with my beer of choice (XXXX Gold) and I continued to enjoy that stubby holder into the wee hours of 2010, not knowing that I was soon to sip my last beer from its delightful neoprene casing! That’s right, my prized batman stubby holder went missing at New Years. All I know is that I went to sleep and when I woke up and cracked a beer with breakfast on 1 January 2010 I was stubby holder-less. That was the last time I’ve done a beer with breakfast since – but it went down super well! I didn’t think much of it until it didn’t show up in the next day or so but I never saw it again! Batman stubby holder and I in happier times.. The most logical (and probably correct) explanation is that it was attached to an empty stubby I chucked in the bin when I went to bed after our New Years party. But it doesn’t make it hurt any less. One day I will go back to Hollywood on the Gold Coast and hopefully they will still sell them. Until then I am filled with a deep longing for that stubby holder everytime I crack a beer and look for just the ‘right’ stubby holder. Today is number 9, fashion: your top 5 looks right now. Anyone who knows me in real life has probably already fallen off their chair laughing. Remember yesterdays post? Things haven’t got much better since preschool!! That pose! The shorts! 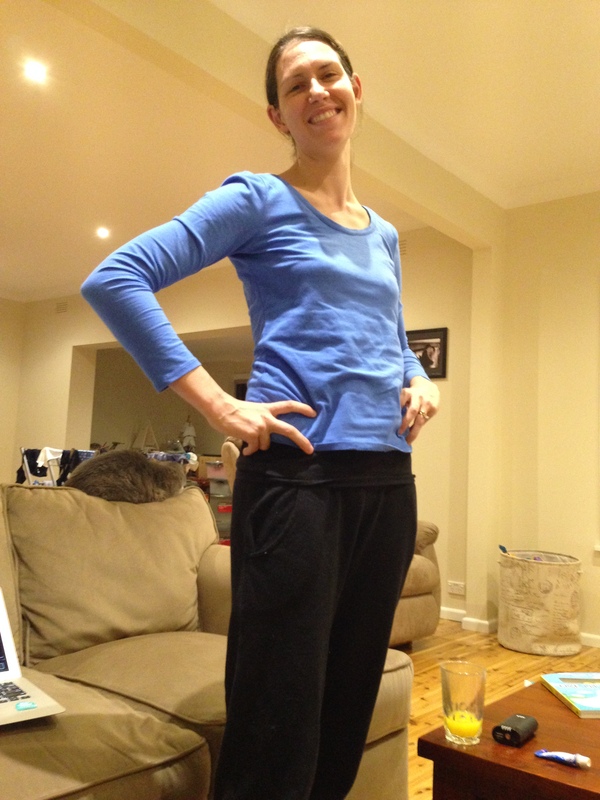 Here I am rocking my bonds tracky daks and top. I haven’t showered today as I was solo parenting, but I did clean my teeth twice. 1. Trackydaks Jen- for getting around in at home. Features tracky daks and a top. Can double as pyjamas – then when you’re having a tough day with the baby, no one can tell you actually didn’t get dressed that day. Hair will be up – see exhibit A. 2. Jeans and top Jen – in winter add shoes and puffy vest. In winter remove shoes, add thongs. Top will have stripes or be a plain colour. Hair will be up, or – if within 3 weeks of new haircut will be down. Until I get sick of straightening it and then right back up it goes. 3. Formal Jen – I choose a dress that fits and wear it. Dress will feature black. Usually with some kind of cardigan/shoulder hiding jacket. In summer to hide my hideous cyclist tan, in winter – for warmth! Hair will be out – straightened. Shoes one of three choices. 4. 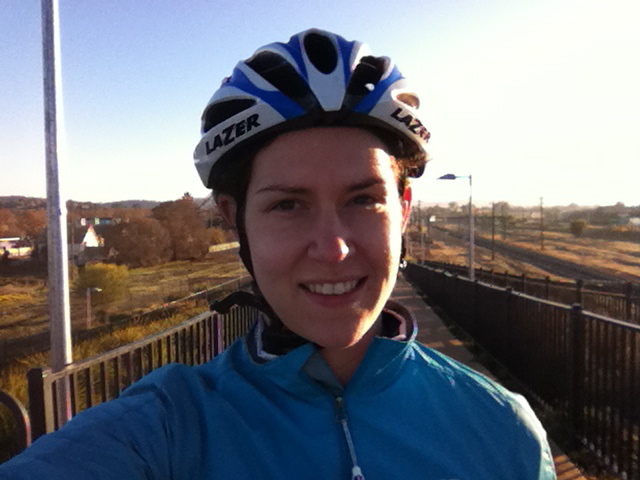 Cyclist Jen – my favourite! Features lycra, in summer bare arms, in winter add arm and leg warmers. Simple, and with a nice piece of kit – elegant. Big smile because it means I’m riding my bike! 5. Running Jen. Check orthotics in shoes. In winter add compression tights, in summer subtract tights, add shorts. T-shirt from previous race/event. Always with a cap. Sometimes I wish I was more fashionable but now I figure, I’m 30 – its not going to happen! But I bet I spend at least as much money on bike related goodies as other friends do on shoes and clothes! #22 The worst Christmas/birthday you ever had (make it funny), I’ve done a different spin and gone the present angle. Dad, Mum, Santa…sorry in advance. I can’t remember how old I was, maybe about 9 – or maybe I was a bit older, anyway at some point..
Santa brought me a golf bag for Christmas. Like a bag you put your golf clubs in. At the time I remember being disappointed in Santa as I had advised him numerous times that I wanted the “Lego Octan Petrol Station’. I had even checked it was still in stock at Big W in the days leading up to Christmas and then on Christmas Eve I think it wasn’t there anymore. I was quietly confident Santa had it all squared away ready to go! Imagine my surprise come Christmas morning when an enormous golf bag is sitting next to (this is the next part of my story) our tiny, pathetic Christmas tree. To make matters worse this year my Mum had decided to ditch the lovely fake plastic tree for a ‘real’ tree. She told us in years to come we would have a proper REAL Christmas tree. In reality we had a tiny shrivelled up brown tree which a number of red back spiders called home. So before my Dad (who I suspect was behind this Christmas present) can get too offended – this particular Christmas present was the one that actually ended up being used the most! In fact, this particular golf bag was used for years when my friend and I used to sneak into golf courses, masquerading as legitimate golfers who’d paid their green fees and all school holidays we’d play golf for free! We only got questioned once and that was when a guy we went to school with was working in the pro shop and saw us out on the course and knew we hadn’t been anywhere near the shop all morning. I used it through uni too! So really, a present that seemed like a dud at the time – was one thing I got for Christmas that I got the most use out of! p.s. this fits perfectly in the #firstworldproblems hashtag. Didn’t exist when I was nine though! Its pretty hard to work out what my ‘earliest’ memory is but I thought I’d write what I thought and then get Mum to confirm/deny! So this was our house in Sydney (thanks Google!). I couldn’t remember the name of the street but knew if I looked over a map of the suburb – Kings Langley that I would recognise it and I did. Once I found the street I just crawled along street view until I found the house! Too easy. Mum tells me we lived here from the start of 1988 until we left for Albury maybe in January 1989. I can vaguely remember living here. I can remember going to preschool, can remember a Christmas pageant where I was dressed up as an angel (Mum said it was a sheep but I thought it was an angel – now we think that I think maybe I’m just remembering the photo…but I feel like I can kind of remember it!). I can remember listening to The Seekers ‘Morningtown Ride’ – I can’t remember if it was at preschool or something to do with preschool..not sure. Mum says possibly they played it at preschool. 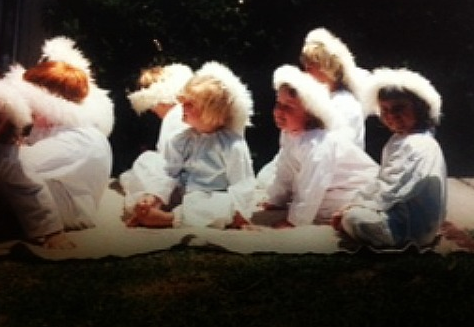 Speaking of preschool, when I gave Mum the task of finding the sheep/angel photo she initially came up with this. Yes I’m the one with no shirt on. No idea why I don’t have a shirt on! I was special even then! I can also remember going to an orientation day at a primary school, but I never ended up going to that school because we moved to Albury! 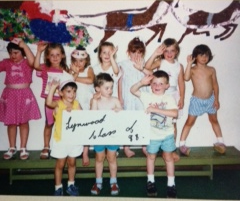 So there you go – my earliest childhood memory – I would have been about 4, I turned 5 in 1989. Does this mean that little man probably won’t remember anything until he’s that age? Phew! How about you? What is your earliest childhood memory? #45 (redux) I set a goal and got there! 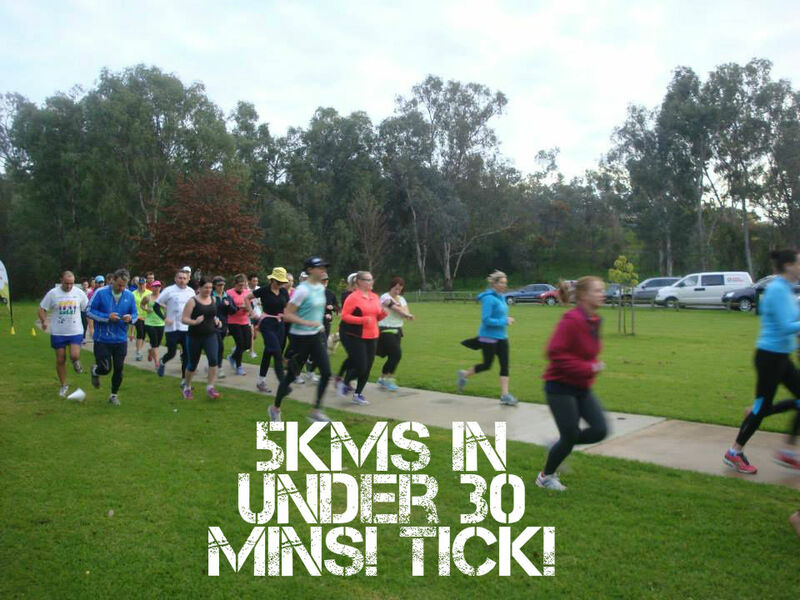 A few days ago I blogged about how I was setting a goal to run 5km in under 30 minutes by the start of August. I reluctantly trotted down to our local parkrun on Saturday morning (I very nearly got back into bed) and smashed out a 27:53. My previous best was 32 minutes so I definitely did NOT as my Mum has suggested set an ‘easy’ goal, I just dug really deep. My knee held up okay, and I reckon I ran a negative split. Hard to say because I ran naked (no garmin) but I was feeling okay at the halfway point and thought that I’d better give it everything I’ve got and then maybe I’ll get close to the 30 minute mark. I didn’t even know I’d done it until I got the email from parkrun with my time, when I got in the car it was 8:38am so I was trying to figure out how long I stood around gas bagging when I’d finished and reckoned it was maybe 5 or 6 minutes so thought I’d come in around 30 – 31 minutes. Anyway, go me. time to get real and set a new running goal. Sub 25 minutes by the end of this year! Today’s is #47 – Share your favourite room in your house and why you love it. If you are a regular reader you will be well aware we’ve been renovating. We are almost finished, in fact it might even be all done in a couple of weeks…although we are toying with the idea of doing the bathroom. Suckers for punishment! My favourite room in our new house is the kitchen! One of our friends Muz designed it and put most of it together for us and it is…amazing. All of it, but the thing I love most is this (best demonstrated by video). Yep, the bin is my favourite feature. I find it very satisfying!